New Jersey's Irish natives expressed their own discontent over British oppression by battling alongside colonists in the American Revolution. Brave Fenians fought to preserve their new home in the Civil War. New Jersey's Irish also have become professional athletes, United States representatives, religious leaders, spies and business trailblazers. Author and Irish heritage researcher Tom Fox relays these and other stories that demonstrate the importance of Ireland to the development of New Jersey and the United States. Thomas Fox is currently a librarian and researcher at the Bella Biondo Research Center of Pope John High School in Sparta, New Jersey. He has previously been employed as an English teacher, history teacher and basketball coach. He has been at various times a member of the Ancient Order of Hibernians, Sussex County Civil War Roundtable, Morris County Revolutionary War Round Table, New York Genealogical and Biographical Society, New Jersey Education Association, Fenian Discussion Forum and Irish Northern Aid. 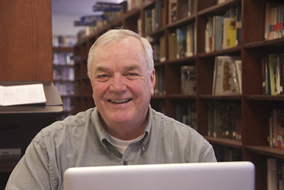 He has published one book, Drummer Boy Willie McGee, which was reviewed favorably in the Journal of Military History, and is a contributor to the recent book, New Jersey Goes to War (Longstreet). He has also conducted an extended history of the Irish surname Sionnach since 1026 (not a family history project) that has been submitted to the Irish Studies Program at Notre Dame.